Chelsea's Russian billionaire owner Roman Abramovich, centre (file pic). RUSSIAN JEWISH BILLIONAIRE and Chelsea football club owner Roman Abramovich arrived in Israel on Monday after receiving citizenship of the Jewish state, local Channel 10 television reported. “He landed today in his private aircraft at (Tel Aviv’s) Ben Gurion airport and was presented with an Israeli identity card,” the commercially-owned station said on its evening newscast. An official at Nativ, a department of Prime Minister Benjamin Netanyahu’s office dealing with Jewish communities in the ex-Soviet Union, said Abramovich had applied for an immigration visa at Israel’s embassy in Moscow, the station said earlier on its website. “His documents were examined under the ‘Law of Return’ and he was indeed entitled to immigrant status in Israel, and as a result he was issued an immigration visa,” it added. Spokesmen for Netanyahu’s office contacted by AFP did not confirm or deny the report. Israel’s Law of Return gives every Jew, or child or grandchild of a Jew, the right to Israeli citizenship on demand. According to media reports, Abramovich’s British visa has run out and the application process for a new visa has been taking longer than usual. Amid a spiralling diplomatic crisis between London and Moscow over the poisoning of a former Russian double agent, there have been calls in Britain for sanctions that would hurt super-rich Russians with homes in London. Abramovich formally has residency in Jersey in the Channel Islands, a tax haven, but has never taken it up. The Sunday Times put his wealth at £9.3 billion on its Rich List this year. He has owned Chelsea since 2003. Email “Chelsea owner Abramovich becomes Israeli citizen - report”. 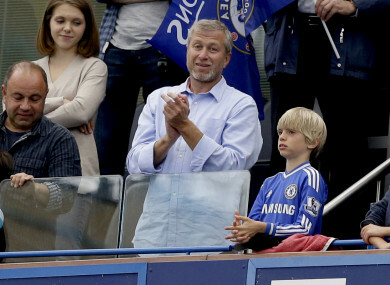 Feedback on “Chelsea owner Abramovich becomes Israeli citizen - report”.